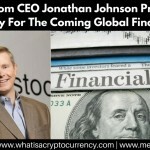 The chairman of one of the biggest US ecommerce companies OVERSTOCK, Jonathan Johnson, has made some major preparations for the coming financial crisis! His company has stockpiled over $10 MILLION worth of gold and silver rounds they can use to continue to supply ‘payroll’ and keep business going during the coming financial crisis. Overstock’s employees will be protected and still have a means to conduct trade during a period when our government issued US dollars will be worth absolutely zero and our way of life will be turned upside down as we know it. Heck he has even stockpiled 3 months worth of dried food for all his employees plus one spouse (or family member) each. Looks like Overstock will still be doing business while everyone else Is down and out of business. Now I’m feeling pretty damn good I acquired a good amount of silver over the years, some gold (which will be a bit less useful than the silver coins unless I’m trying to buy something much more valuable during these upcoming times of financial malaise for our country and the world.) It’s much easier to spend and trade the less valuable but still significantly valuable silver coins… Just look, one single US issue silver eagle (1 oz of .999 silver). Is worth almost $20 per coin right now and will be quite a lot more valuable than that after the reset happens. We could be looking at triple the value or more per each silver ounce coin. I have also prepared in another way. Through Cryptocurrency with Capricoin. Cryptocurrencies are not controlled by a central bank or government and their value is not tied pegged or tied to any fiat currency (like the US dollar.) So when fiat currency fails us (inevitable), the value of cryptocurrencies will be more likely to stay the same or increase significantly in value as opposed to drop in value. Just think about it, the demand will be greater than ever for a fully fungible and functional currency that we can conduct trade with and go on with life as we need to. Cryptocurrency has helped many people in situations of financial crises that have been happening around the world recently (i.e. Greece, Spain, Portugal) and since financial contagion is just around the corner for the US… what we can do to get ready for it and protect our financial futures and families is right in front of your eyes! 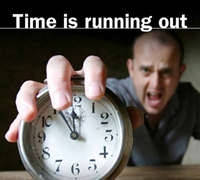 What are you going to do while there is still time? This moment of time we are in is historic, we still have the buying power of the US dollar to get ready for when that buying power is gone forever! I ask again, what have you done or what are you going to do to prepare yourself while there is still time left? If you have any questions about cryptocurrency and would like to discuss, I’d be more than happy to talk to you. Feel free to reach out to me on Facebook or just give me a call at 1.802.444.0667. Want more news, information and education on cryptocurrency in general? Make sure you become a regular visitor of my Educational Cryptocurrency Blog! Hello my friend! It's been a minute, but I thought you'd find this article very interesting so just forwarding the info along to you. 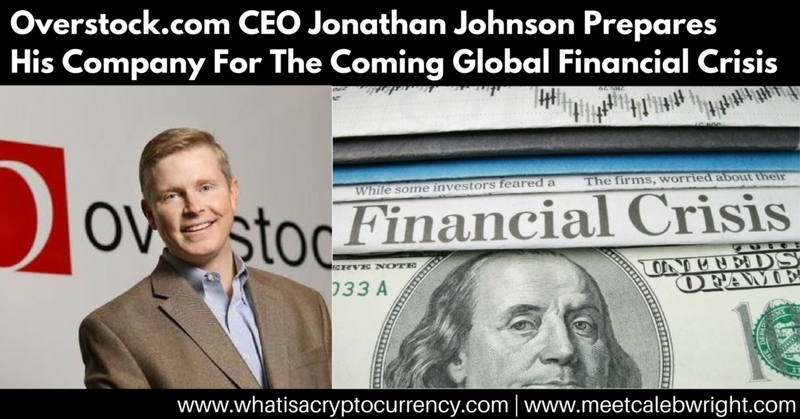 The article is called Overstock CEO Jonathan Johnson Prepares For The Coming Financial Crisisand is located athttps://www.meetcalebwright.com/cryptocurrency/overstock-prepares-for-financial-crisis/. Let me know what you think!